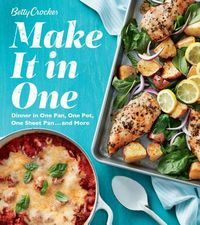 The bible for inventive, on-trend meals for one or two--from the right-size pans to just-right entrees, sides and desserts Betty Crocker makes cooking for one (and maybe one more) easier and more economical than ever with a complete assortment of almost 200 perfect-fit recipes. She's delightfully re-imagined beloved classics like Black and Blue Mini Meat Loaves and quick-and-easy dinners like Pan Asian Salmon and Vegetables. 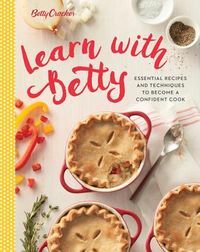 Even dessert is made sweeter and simpler with personal treats like Cherry Cobblers for Two. 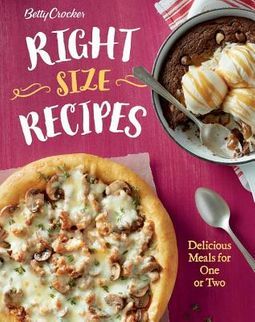 Right-Size Recipes makes cooking effortless and fun, with recommendations for the proper equipment, advice on navigating the grocery store to shop small, and lessons on transforming or stretching leftover ingredients and meals into another delicious entree for less repetitive leftovers and more delightful cooking. Holidays and special occasions are also handily scaled to size, with a sheet-pan Thanksgiving dinner for two, menus for a romantic dinner or a stay-in movie night, and more.